Another LOLable outfit from 1997 that was duly packed and transported up to Port Hedland. I first posted about my unpreparedness for the realities of Pilbara living here. Fun fact: Port Hedland is only 200kms (ie, next door) from the hottest place in Australia, Marble Bar. Although, to be fair, I did leave Adelaide mid-winter. Everyone got air conditioning subsidies from BHP and, in the days before climate change was a thing, most houses were a chilly 16 degrees all year round, meaning we sat around in jumpers and trackies and slept under quilts. Seriously, the weather was so predictably monotonous, the local radio station's weather was pre-recorded and the same announcement played every day; "Port Hedland, fine and hot, 38 degrees." You'll notice none of these pics are taken outdoors. So what are we working with here? 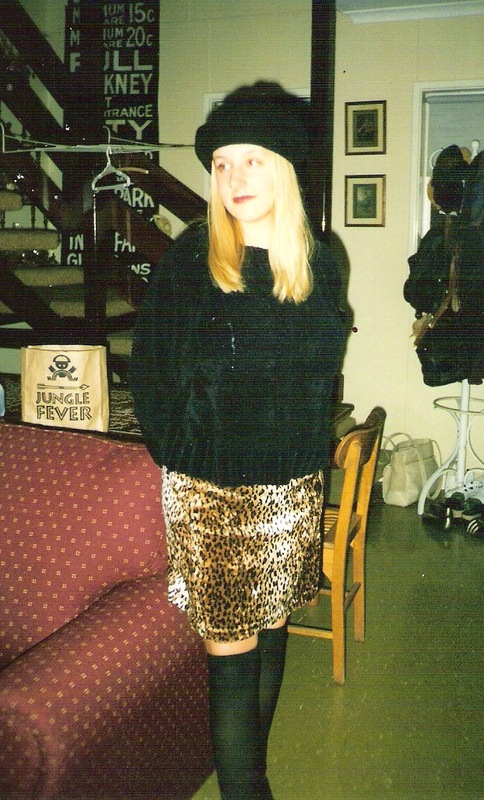 Velour leopard-print skirt. You can probably get one in Supre right now but believe it or not, I have this very same one chilling in the vault *. Dat beret. Still have that too. See the bus roll on the wall at the back? Mum and Dad had a legit one waaaay before the hipsters and Cheap As Chips caught on. I wonder if they still have it. Hmmmm. You can enjoy laughing at more of my 90s looks here. * Elderly suitcase under the spare bed, housing items I just can't let go of and that may one day become historical items of importance, legit vintage for my daughter or, at the very least, material for a future blog post.